HCM CITY — Bahrain will open its trade promotion offices in Hà Nội and HCM City to facilitate trade with Việt Nam and other countries in the ASEAN bloc. 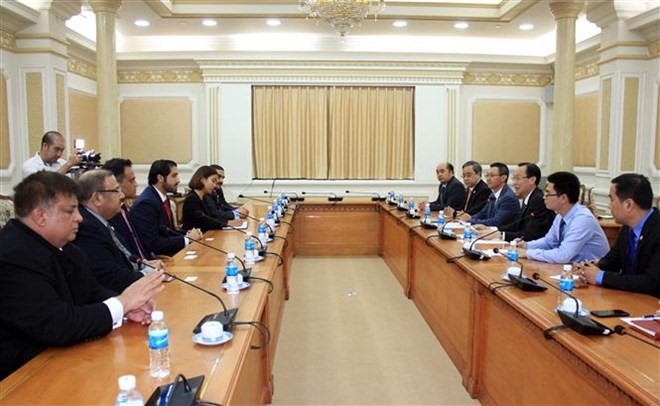 This was announced by Sheikh Daij bin Isa Al Khalifa, chairman of the ASEAN-Bahrain Business Council, at a meeting with Lê Thanh Liêm, vice chairman of HCM City People’s Committee, on Monday. Bahrain, which boasts huge oil reserves and is a financial centre of the Middle East, has various favourable policies to attract foreign investors, including those from Việt Nam, Khalifa said. He added that the ASEAN-Bahrain Business Council was established in 2017 to bolster business ties as well as exchanges in trade, sports, tourism and culture between Bahrain and the ASEAN member nations. The council’s delegation is on a visit to Việt Nam to attend a trade fair in Hà Nội and seek trade cooperation opportunities in the country, he said. Liêm applauded Bahrain’s initiative to open a trade representative office in the southern hub, expressing his hope that the visit will bolster trade ties between the two countries in general and between Bahrain and HCM City in particular.